Cumulative symbolism throughout this film overshadows the potentially interesting narrative. Early on, we get scenes from 1977 Berlin when the Baader-Meinhof group is clashing with police in robberies, kidnapping, and assassinations; and Lufthansa flight 181 is highjacked to secure the release of Red Army Faction prisoners. Soon after, we observe a young woman desperate to see her therapist banging on his door and incoherently reporting on strange events she has observed at her ballet academy. He regards her as delusional, but later learns that she has been found missing, which is troubling to him, a man grieving for his wife, who has also disappeared during the political conflict. 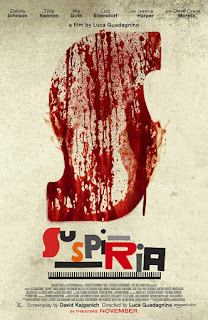 The connection between these events and the subsequent story about a coven of witches within the ballet academy will be puzzling to most viewers, although in broad terms, they all seem to relate to the film’s title, Suspiria, a Latin term meaning “sighs from the depths.” Perhaps it all has to do with the suffering that occurs among lower figures in a hierarchy as a function of the struggles for power among leaders, something that can occur at state levels on down to performance academies. Importantly, sacrifice always seems to be involved. Within the ballet academy, the primary setting for the drama, lead dancers are getting freaked out by suspicious events occurring behind the rooms that are open to the dancers. It’s surprising when a newcomer arrives for her audition and so impresses the academy staff, she is immediately awarded a lead role. This is Susie (Johnson) who, despite being warned about dangers, maintains an air of self-assurance and aplomb. The horror aspect of the film is gradually ramped up as it becomes more and more evident that the occult with violent manifestations is involved. The numerous dance scenes in general are very exciting (beautifully choreographed by Damien Jalet), the most artistic and dramatically successfully being when a soloist’s percussive, aggressive movements are cross-cut with scenes of another dancer being mutilated and killed by actions and movements that mirror the soloist’s. On the other hand, as good as the final dance performance is, it is extended far too long in an agonizing way. Luca Guadagnino’s transition from last year’s romantic Call Me By Your Name to the political horror story of Suspiria is taking many by surprise. It’s receiving mixed reviews and reactions, partly because of its artsy, intellectual nature, I think. It would perhaps have been much better if Guadagnino had omitted the political references in the beginning, and focused only on the intrigues at the ballet academy. That would also trim the film down from its lengthy 2½ hours. It’s much too long, especially as the final dance scene seems to go on forever. This is probably Dakota Johnson’s best performance and biggest role in her career. She is especially to be praised for executing all her dance scenes, using a double only about 10 percent of the time. But beyond this, she captures the complex personality of Susie, a Mennonite from Ohio whose confidence in herself is up to that of a seasoned ballet student from New York, and yet she’s able to earn the goodwill and respect of her fellow dancers and teachers. Tilda Swinton inevitably stuns with her ability to become any character in a drama, whether male or female, young or old. Here, she is well suited for the role of the high-minded artistic director of the academy, the compassionate older male psychiatrist, and the hideously formed leader of the coven, Helena Markos. 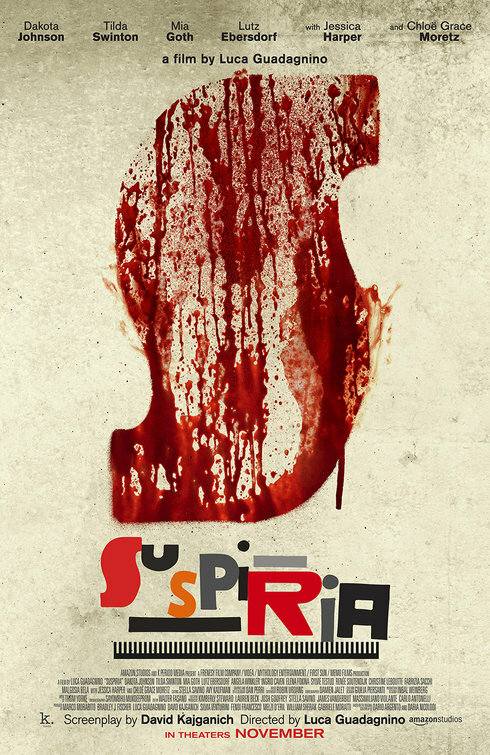 Filmed by Guadagnino’s cinematographer for Call Me By Your Name, Suspiria is likewise a cinematic work of art. Heavy symbolism overshadows the plot about strange happenings in a ballet company.